Is it time for Bankruptcy? You are at the end of your rope. Nothing you have tried seems to work. You can’t duck the collectors, and you don’t have the ability to pay them anything meaningful. But you have something to lose, even if it is only part of your paycheck. You don’t want to be living in a cardboard box down by the river, do you? It’s time to consider the bankruptcy option. Bankruptcy should never be the starting point for considering the solution to your financial problems. Neither is it the end of your problems. Bankruptcy is not a cure-all, but it is a tool to be used in the “fix-it” box for finances. The important thing to do is to learn as much about personal finance as you can so you can avoid making the same mistake twice and then use the bankruptcy tool to start on the road to recovery. Let’s get rid of some of the myths first. You will not be forced to sell all your property, but you may not be allowed to keep that Rolls Royce. You don’t get to pick which creditors are listed in your case – you have to list everyone and everything, but you might make a deal to pay some of them anyway. And even though those creditors are discharged and prohibited from collecting from you doesn’t mean that they won’t break the law and try anyway. 1. 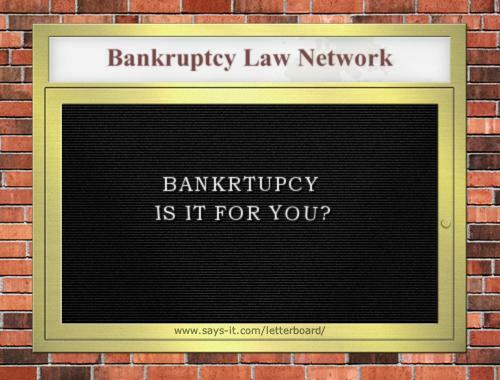 Contact a qualified attorney who knows about bankruptcy. One of the attorneys on this site is a good start. But if one of us is not in your area, then look up an attorney on the NACBA website. 2. Open your mind to the possibilities. Even though you might have learned a lot on this site, everones situation is different and there may be solutions that work for you that you cannot imagine. 3. Get organized and stay organized. Even after your bankruptcy case is over. You will need to stay on top of all of your financial issues.